A sleek and muscular Classic S with a roasted birdseye maple neck! I say this about every Tuttle I play, but this is my new favorite guitar! As to be expected, it plays like a dream and is powerful and nuanced all at once. Comfortable, fast, and responsive - I can't think of enough good things to say about this one! If you haven't tried a Tuttle yet get ready for all your other guitars to pale in comparison. 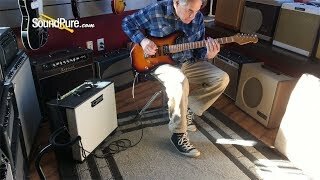 In this video, Sound Pure electric guitar specialist Eddie Berman plays a Michael Tuttle Custom Classic S through a Carr Telstar amplifier. For the past two decades, Michael has specialized in the fine art of what it takes to make a piece of wood feel good. Michael makes the necks feel like they're a part of your hands from the moment you pick them up. Neck Shape: .850 - C - 12"